It was a unique friendship that these girls did share. A friendship of many giggles and a few tears. They loved each other fiercely. They were "best friends" in the making and we knew their friendship was going to last forever. My heart breaks for the friend that Ella has lost. Ella's mommy, Eileen (who is one of my best girlfriends), tells me how Ella still talks about Vienne. She blows kisses up to her, in heaven. 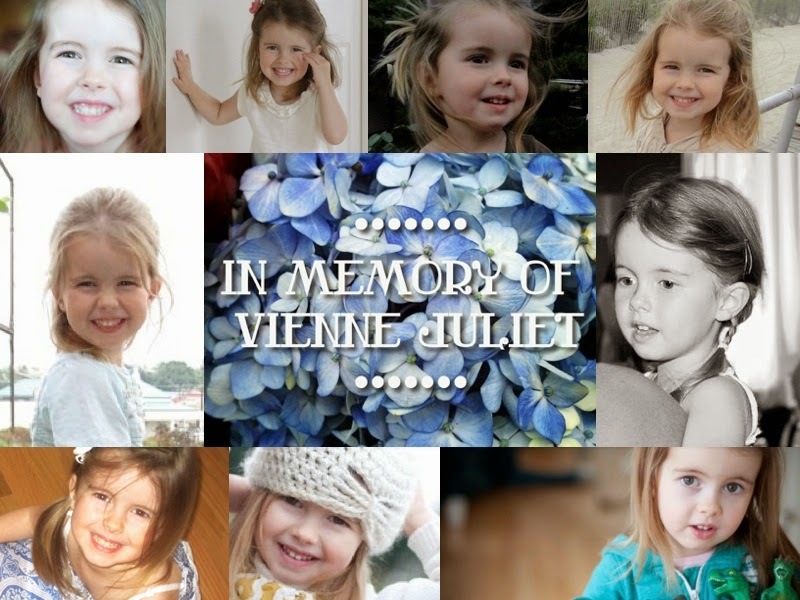 She creates cards for her and asks her mommy to send them to heaven for Vienne. Eileen and I met in the summer of 2011, while we were both pregnant with our second girls. They lived right across the street from us. We were instantly bonded, like sisters. How exciting it was for us have two girls, each close in age! Our youngest girls, Ivy and Faith are only one month apart. Vienne and Ella's birthdays are exactly one year and a day apart - May 1 and May 2. It was all so ideal and wonderful. Especially to be living right across the street from one another. Oh how dreams change. I don't know if I will ever understand the purpose to these shattered dreams. Today is Faith's 1st Birthday! Yesterday, we attended her party - a beautiful snowflake party. I remember the day she was born, one year ago. I was so honored to be their emergency call when Eileen went into labor. Three weeks before her due date, I received a phone call alerting me that it was time! So, I headed across the street to pick Ella up and bring her back to our home for a slumber party while her Daddy and Mommy went to the hospital to have a baby. We had a fun evening together, eating dinner, watching Christmas movies, having a dance party, and reading Christmas stories. I remember, much to my surprise, receiving a phone call from Jeff, Ella's Daddy, that Faith had arrived just a few hours after they got to the hospital! It was so exciting to be a part of that with their sweet family. Here is a special video from that very night, of the girls having a dance party together. I love Ella's repeated exclamation: "It's a wonderful day!". Aren't they both just so lovely? Oh my goodness. These two girls dancing. My heart breaks in a thousand pieces. I had the pleasure of sharing time with Ella last night at her sister, Faith's, first birthday. I told her I was Vienne's grammy. She said "I miss Vienne. She's in heaven" and then she said something about VN having birthday parties in heaven. Then we spent the rest of the evening together making play dough snowmen and playing in her room. She was much more amusing than the adults at the party! I felt so blessed to spend that time with Ella...VN's friend. Then I wept for the rest of the night. Thank you my sweet, beautiful friend for this post. We all love you and your family so much and thank God all the time for bringing us together. We miss V so much and are thankful for the memories we have with her. Oh, we love this video. We keep watching it over and over and over.